Showing 40 of 9875 results that match your query. 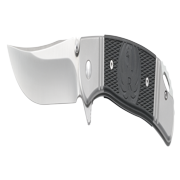 Product - Kershaw Brawler (1990) Folding Pocket Knife with 3.25” Back-Oxide Finished High-Performance 8Cr13MoV Steel Blade; Black Glass-Filled Nylon Handle Scales with Reversible 4-Position Pocketclip; 3.9 oz. Product - Kershaw Blur, Glassbreaker Folding Knife (1670BGBBLKST); Partially Serrated 3.4” 14C28N Steel Blade, Anodized Aluminum Handle with Trac-Tec Grip, Glassbreaker Tip, SpeedSafe Opening, Pocketclip;4 OZ. Kershaw Blur, Glassbreaker Folding Knife (1670BGBBLKST); Partially Serrated 3.4” 14C28N Steel Blade, Anodized Aluminum Handle with Trac-Tec Grip, Glassbreaker Tip, SpeedSafe Opening, Pocketclip;4 OZ.